5 Years Of Modi: Is Indian Real Estate's ‘House’ In Order? Like it or lump it, but Modi’s victory in 2014 ushered a new era in Indian real estate – starkly marked by his vision to set the ‘house’ in order and alter the scarred face of an unorganized sector beset by unscrupulous activities. He tightened the Centre’s grip on real estate – previously the largest dump-yard for black money hoarders – and introduced big-bang schemes to benefit consumers. The measures he took to achieve this did have short-term negative impacts, but nobody can argue that this is a case where short-term pain is necessary for the sake of long-term gain. That said, the on-ground implementation for most of these initiatives is far from what could have been achieved even in just five years. This ‘trishul’ brought about a paradigm shift in the way Indian real estate does business and laid the groundwork for improved transparency and efficiency in the sector. However, while end-user and investor confidence was rekindled for real estate, it did not exactly set the industry on fire with renewed interest. Despite the Centre’s aim to enforce RERA across states, it still falls far short of the intended deployment targets – both quantitatively and qualitatively. Even today, many states have not yet notified their RERA rules, while in other states, buyers are justifiably outraged about the dilution of rules that have been notified. The sector braved the fallout of GST and DeMo but was hit hard in the short-term. A flat 12% GST on under-construction homes remained a huge burden until April 1 2019 – the fag end of the Modi government’s current term – finally brings some relief in what could, rightly or wrongly, be construed as last-ditch electoral damage control. In its maiden budget, it set up NICA (National Industrial Corridor Authority) which is tasked with executing 5 industrial corridor projects, each passing through various industrial clusters, towns and cities. On the completion of this undertaking, we will see some very convincing real estate growth the hinterlands which will be connected by these corridors. Apart from industrial real estate and the natural spin-off demand for housing around industries, this initiative will also boost the demand for logistics and warehousing. Ever since the Modi government came to power and proclaimed the thereafter much-touted ‘Housing to All by 2022′ vision, the term ‘affordable housing’ became the new buzzword. This segment was accorded infrastructure status, and the government stated its intention to provide one crore houses under PMAY in urban areas between 2015 and 2022. This was not just hot air and came with multiple sops to actually induce action in the budget homes segment which certainly aroused interest among both buyers and developers. The previously avoided ‘affordable’ suddenly became respectable and even attained a patriotic tint which developers were quick to capitalize on. The term ‘affordable’ has historically been the second-most misused term in Indian real estate after ‘luxury’. This dynamic took on a whole new dimension after the Housing for All by 2022 mission was announced and backed by various incentives to buyers and developers. The way developers interpreted ‘affordable’ in the past was by in terms of compromised quality, inferior locations and the most basic amenities. RERA, wherever it has been deployed, has put an end to this interpretation to some extent – but then, RERA is neither a nation-wide phenomenon nor a uniform one when it comes to specific states’ versions of it. In any case, progress under PMAY has been slow and as of now, we’re not looking at realistic completion of the targeted number of homes. As per MoHA, out of the total 79 lakh homes sanctioned under PMAY as on March 2019, only around 39% have either been completed or occupied. The gap is a little too big to ignore. Initiatives like 100 Smart Cities, AMRUT, HRIDAY, Make in India etc. have undoubtedly induced new vigour into the Indian real estate market, with direct or indirect impacts. The Modi government has put in ceaseless efforts to improve India’s position on the Ease of Doing business rankings. This has had positive implications for the commercial sector, which obviously also boosts residential real estate demand. In theory, the ambitious 100 Smart Cities program aims to transform the selected cities’ real estate markets, but it has definitely not unfolded as planned. Rather than the larger cities – which, due to their larger municipal wealth, would logically have been expected to be the forerunners – it was some of the smaller cities selected under the Smart Cities program which actually showed the most progress. 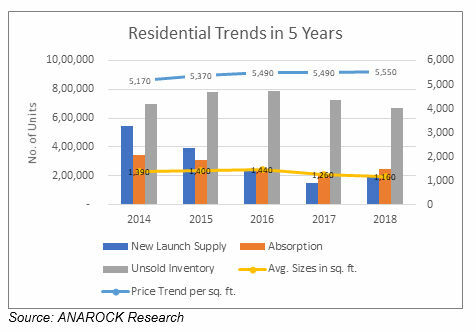 While the commercial and retail real estate sectors definitely assumed a steep upward trajectory after various reformatory changes, the numbers indicate that the doors are still largely locked on the Indian housing sector. This is perhaps not surprising since this segment had historically attracted the bulk of black money in the Indian real estate system. Back in the ‘heyday’ of the Indian residential sector, builders launched whatever they wanted, wherever they wanted to launch it. Today, we have a massive demand-supply mismatch, and the realization that supply must follow ‘real’ demand came a little late to give the Modi government much room to save the day. Due to the relatively newly-adopted cautious approach by developers, the top 7 cities saw the supply of new housing units reduce by 64% in the last five years – from 5.45 lakh units in 2014 to 1.95 lakh units in 2018. Housing sales were also slow, dropping by 28% during the same period – from 3.43 lakh units in 2014 to 2.48 units last year. Following the Modi government’s push for affordable housing, this segment has grabbed the attention of even the leading developers of the country. As per ANAROCK data, the share of new affordable housing supply (homes priced below INR 40 lakh) has been increasing from 2015 onwards. Post-2017, its share dominated the overall supply in the residential market. Also, the number of affordable units launched across the top 7 cities was nearly 77,590 units in 2018, rising by 18% against 2017. If we break it down further, nearly 25% of the total units in the affordable category are priced below INR 20 lakh. This share has increased by 17% in 2014 to 25% in 2018. Compact homes have become the new normal in the expensive metros, and builders are not shying away from offering such housing regardless of their market orientation in previous years. The average property sizes in the top 7 cities shrunk by 17% in 5 years; from 1,390 sq. ft. in 2014 to 1,100 sq. ft. in 2018. Property prices in the primary markets have seen more of a ‘time correction’ rather than a price correction, with average prices across the top 7 cities seeing a meagre 7% increase in the 5 years. Considering inflation (assuming 7% a year) all cities will have seen negative price trends in the last 5 years. While the current government’s intention to set Indian real estate’s house in order warrants accolades, much more is needed going forward. Amidst new trends emerging in residential real estate, the last five years have seen the sector held to ransom by multiple issues including stalled or delayed projects, a massive pile-up of unsold stock across cities (despite the housing shortage), property prices that remain unaffordable for the largest part of the population, and the ongoing credit squeeze on developers. GST rate cuts and budget sops will not cure these ills – the immediate need is for a much broader strategy. Creating uniform taxation between under construction and ready-to-move-in properties. Reducing developers’ dependence on costly external funding sources like private equity by proactively easing lending norms and further boosting consumer confidence to help advance sales increase. Unfettering stalled or delayed projects – a syndrome that has severely diminished buyers’ faith in under-construction properties. Measures must be taken to ensure that such projects are either completed or their buyers fully reimbursed their stuck money so that they can focus on other housing options. RERA implementation across all major states cannot remain on paper. It must leave the bureaucratic discussion tables and become an on-ground reality. There are no two ways about this.